Introduction: One of the frustrations of teaching physics is trying to conduct meaningful laboratories within the constraints of your departmental budget. You may desire to have your students using computers, oscilloscopes, spectrophotometers and other expensive laboratory equipment but simply can't afford to supply each laboratory group with the necessary equipment. Due to financial constraints many instructors resort to the demonstration approach whereby they merely illustrate the principles to be studied from the front of the room. Unfortunately, this deprives students of the "hands-on" experiences which are so essential in any laboratory science class. Fortunately, there is a method whereby you can provide "hands-on" experiences for every student and simultaneously enhance laboratory performance. The Traditional Approach: Traditionally, most instructors schedule laboratory experiments once a week immediately following the time when the relevant material has been presented in class. This approach has a particular appeal because students can immediately apply the principles that they have just learned from lecture, discussion and the text. Unfortunately, if you have just talked about a fascinating topic such as the method for calculating the wavelength of light using diffraction gratings and lasers, it will be virtually impossible to have your students verify what you have just discussed simply due to the fact that you don't have the necessary financial resources. The Rotating Assignment Approach: Using this approach the instructor saves up all of the laboratories which would be conducted during a normal quarter or semester and then gives the students 5 or 6 weeks of time that is to be entirely devoted to laboratory work. Each individual is assigned to a laboratory group of two or three students which remains together throughout the 5 or 6 weeks. Each group has a unique schedule so that no two groups will require the same station simultaneously. Each day the groups rotate from one station to the next. At the end of this period a couple of make-up days are provided so that students can go back and complete unfinished laboratories or rework some in an effort to obtain better data. The specific instructions which are given to the students are provided for your reference so that you can get a better understanding of the structure of this system. (1) Carefully read the instructions associated with each experiment prior to class. (2) Come to class with the appropriate data sheets. (3) Write up your experimental findings in the standard fashion being careful to always include your introduction, data, analysis, conclusion and recommendations for improvement. (4) Each group will compose the write-up as a joint effort. Every member of the group will receive the same grade. (5) During periods of slack time observe the group which is performing the experiment which is next on your list and take notes on experimental set-up and technique. (6) Explain to the group which follows you the concepts and pitfalls of your experiment. (1) Students have the opportunity to perform experiments with expensive, sophisticated equipment that they would otherwise couldn't. 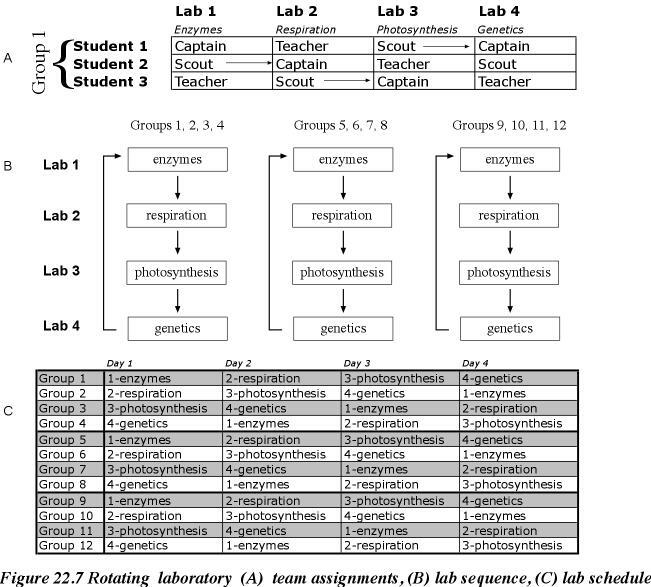 (2) Much time is saved in terms of explaining experiments as students observe the group in front of them in the sequence to see how the experiment is set up. (3) Inter-student cooperation is increased as students share with each other the techniques that they found to be successful. (4) "Hanging experiments" can be finished without wasting time. If a group has not completed an experiment they can have one member from their group complete it the next day while they move on to the next one. (5) Student interest is increased as students see a wide range of experiments in progress at any particular time. (6) There is no confusion about what is expected since students have an explicit schedule to follow with detailed instructions and since there are no other interfering distractions since every day is devoted to laboratory. (7) Experimental technique is greatly enhanced as students have repeated, uninterrupted exposure to experimentation. We found that this method invariably resulted in better experimental results and greater student satisfaction due to improved results. (8) It provides greater interest for the instructor because of the variety of tasks being conducted simultaneously. (9) Postponing the labs to the end of the semester provides for a natural review period prior to final exams as students must review and apply concepts previously learned during the quarter. (10) The cooperative atmosphere more closely resembles true scientific research. (1) Students are not able to immediately apply concepts learned in class in the laboratory. (2) The first few days are rather chaotic as students have not had previous groups to observe. (3) This method requires extensive instructor preparation prior to execution. (4) The instructor is grading a variety of lab reports at any one time rather than everybody's report on the same experiment.